As can be divined from the CD’s title and track-listing, this is a journey through the Church’s Year, with specific reference to Lincoln Cathedral. It is appropriate in this secular age that the excellent liner notes include a succinct, but informative, two-page introduction to the progress of the Christian Year. This detail will not be a revelation to most enthusiasts of this kind of music, but hopefully, it will be rewarding to listeners who have little connection with the tradition. As I complete this review, we are in preparation for the Birth of Jesus Christ on 25 December 2018. Even though this has been ongoing since the middle of September in many shops, the true beginning of the Christmas Season and the Christian Year was Advent Sunday on 2 December. The Choir of Lincoln Cathedral begin with a thoughtful, but ultimately urgent, account of William Byrd’s setting of St Mark’s text (Mark 13: 35-37) enjoining the faithful to watch for the coming of the Lord: ‘Vigilate’. This is followed on Christmas Day by the well-known traditional French carol Ding Dong Merrily on High in the Wilberg and Stevens arrangement. The organ part in this version is particularly stunning. Felix Mendelssohn’s ‘There shall a star from Jacob come forth’ featured in the unfinished oratorio Christus. This anthem celebrates the coming of the Three Kings and the Epiphany (manifestation) of Jesus as the Christ to the Gentiles with reference to New Testament ‘history’ and Old Testament ‘prophecy’. It is clearly an attractive and popular piece, but I find that it just a bit insipid. The work is in three sections, opening with a recitative, followed by a trio and concluding with a chorus. Very shortly after putting away the Christmas decorations, the Shrove Tuesday pancakes are being made and Ash Wednesday is upon us. This is the start of Lent which is a season of preparation. This includes, for Christians, a personal and global recognition of the sinful nature of humankind, individually and collectively. Samuel Sebastian Wesley’s High Victorian anthem ‘Wash me Thoroughly’ meditates on the need for forgiveness. Look out for the long-breathed melodies, gorgeously subtle harmonies and delicious suspensions. It is a perfect miniature. Edward King was an Anglo-Catholic (High Church) bishop of Lincoln who died in 1910. He is fondly recalled by this ‘wing’ of the church and is commemorated with a ‘black letter day’ or ‘lesser festival’ on the date of his death, 8 March. Patrick Hawes, well known for his Highgrove Suite and lately his Great War Symphony, has provided a lovely anthem. ‘My Dearest Wish’ which is based on texts from King’s writings. It has a ‘wide-ranging’ vocal line, gorgeous harmonies and is accompanied by a well-judged organ part. Truly lovely: a credit to Bishop Edward King’s life and work. The Feast of the Annunciation is usually held on 25 March. Clearly this is exactly nine months before Christmas Day. Sometimes, this is in the middle of the Easter Celebrations when it is ‘translated’ to a suitable date after Easter Monday. Robert Parsons, who was a near-contemporary of William Byrd, is the source of a characteristic setting of the Angel Gabriel’s words ‘Ave Maria’- ‘Hail Mary.’ This is a deeply-considered anthem which gives rapt attention to the text and provides a heart-easing blessing on this auspicious day in the Church’s calendar. It is believed that poor old Parsons drowned in the River Trent at Newark. William Byrd succeeded him as one of the Gentlemen at the Chapel Royal. Thomas Tallis’s Salvator Mundi (O Saviour of the World) has been selected to recall the darkness of Good Friday when Christ died on the Cross. It was published in the 1575 volume Cantiones Sacrae which was a joint enterprise with William Byrd. This perfectly engineered anthem sees the opening plainchant develop into the wonderful world of polyphony. Few listeners to ecclesiastical music can be unaware of Bob Chilcott’s contribution to the genre. The present anthem for Easter is not a triumphant shout, but a profound contemplation, inspired by a text by George Herbert, ‘The Arising’. This anthem showcases Chilcott’s wonderful harmonies and magical melodic lines. It is a restrained work that considers the spiritual, rather than the historical, aspect of the Resurrection on Easter Day. The Feast of the Ascension, where Jesus is taken up into heaven, is celebrated with Gerald Finzi’s largely atypical anthem ‘God is Gone Up’. This great paean of praise was composed during 1951 for that year’s St Cecilia’s Festival at St Sepulchre-without-Newgate Church, Holborn Viaduct. It is far removed from the quiet pastoralism that Finzi is typically (sometimes unfairly) recalled. From this point onward, the Church enters the long (seemingly interminable) period of Trinity. Look at the Prayer Book – from the First to the Twenty-Fifth Sunday[s] after Trinity! The present CD from Lincoln has included several liturgical highlights that occur during this ‘teaching’ period in the Church’s Calendar. The most ‘modernistic’ work on this CD is Judith Bingham’s setting of the ‘Corpus Christi Carol’ which honours the institution of the Eucharist. This piece makes a musical journey from light to shadow. Charles Wood’s ‘O Thou, the central Orb’ was selected to celebrate the Feast Day of the Blessed Virgin Mary on the 8 September. Wood’s anthem “speaks of the joy of faith, the company of the saints and the transformation of love that God brings to those who trust him”. His setting is largely romantic in sound with its solo bass part and reassuring ternary form. The powerful conclusion is stunning. The trumpet, played by Sgt Tom Ringrose, is used to point up the effect of Mark Blatchly’s setting of Laurence Binyon’s great poem, ‘With Proud Thanksgiving’. The traditional bugle call of the ‘Last Post’ is introduced during the final verse, ‘At the going down of the sun…’ The general progression of Blatchly’s piece is a march with a singable tune. The liner notes are correct in suggesting that this music looks back to Elgar and the early twentieth-century. No introduction is needed to Johannes Brahms’s beautiful ‘Wie lieblich sind deine Wohnungen’ (How Lovely are thy Dwelling Places) from A German Requiem. It is sung here in German. This piece was picked to commemorate (17 November) St Hugh, onetime Bishop of Lincoln. The liner notes state that the text’s “longing for the divine presence” is entirely appropriate for a cleric who worked so hard for Lincoln’s faithful and for the fabric of the Cathedral. The penultimate track features John Taverner’s ‘Christe Jesu, pastor bone’ chosen to celebrate the Feast of Christ the King. This festival is usually on the Last Sunday of the Church’s Year, that is, just before Advent. It is seen as a summing up of the events that have gone before. Taverner’s music is restrained and forward-looking towards the achievement “of Thomas Tallis and his contemporaries”. The final track is Ralph Vaughan Williams’s ‘Antiphon’ from his Five Mystical Songs. These settings of George Herbert’s poetry were completed in 1911. Herbert is commemorated in the Anglican Tradition on 27 February. So, it is a wee bit out of chronological order here but makes a good closing number. ‘Antiphon’ is written for choir alone. This is a great song of praise. The words “Let all the world in every corner sing: my God and King”, is the triumphant refrain. Frank Howes has suggested that this song is a ‘moto perpetuo’ that reflects the Sea Symphony with its boisterousness. It is a splendid and uplifting conclusion to both the Mystical Songs and this CD. Great sound quality on this disc. Excellent performances from all concerned. Splendid liner notes. 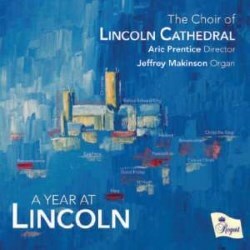 This new release from Regent perfectly presents Lincoln Cathedral Choir, the organ and the Church’s Year. A rare treat, indeed.